Donald Lutz drives in two of the Reds’ six runs with a single in the sixth inning. The Cincinnati Reds rode two big innings to a win yesterday, but that wasn’t the real story. No, that belonged to Johnny Cueto, who pitched for the first time since straining an oblique in the first game of the playoffs last year. Cueto’s outing wasn’t awesome, but he reported no pain from his injury. His final line was 2 innings, 4 runs (2 earned), 1 walk, and 1 strikeout. It’s very nice to see him back on the mound again. The Diamondbacks’ lead vanished quickly in the 6th. The Reds scored a total of 6 runs. Kris Negron hit a triple to drive in a run. Joey Votto singled in a run. Donald Lutz doubled to drive in 2 more. And Henry Rodriguez finished the scoring with the final RBI. The Reds scored more runs later in the game, putting it further out of reach. Today the Reds will split up their squad. One group will travel to play against the Colorado Rockies at 3:10 pm, while the other group will stay in Goodyear to host the Diamondbacks. Aroldis Chapman starts against the Rockies, while Mike Leake starts against Arizona. The deadline is approaching, and Joey Votto still hasn’t decided about playing for Canada in the World Baseball Classic. So far, Votto’s performance in Spring Training has been good, indicating his knee is doing better. In four games, he has a home run and four RBI. Oh, and his on-base percentage is an amazing .600. Apparently, Team Canada is scheduled to play the Reds on March 7th. 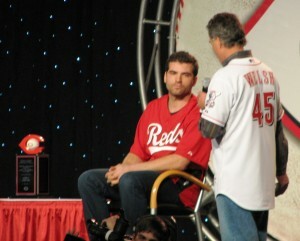 Assuming Votto does join the roster, he has decided about that game. I empathize with his decision. He gets paid to play for the Reds every year, but the chance to represent his country in a world competition only comes a handful of times. I’d rather he didn’t participate, but I do trust him to keep himself healthy should he decide to do so. 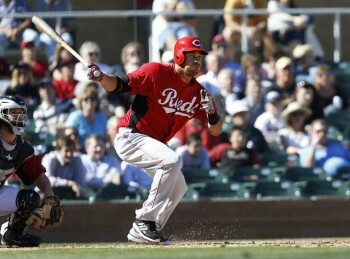 The Reds wrapped up their first spring training series yesterday when they lost to the Indians. In fact, it’s been three losses in a row to the Indians to start off this training season, but yesterday’s was special in that the other two were slugfests in which the Reds just happened to be behind when the innings ran out. Still, with 20 runs scored in the first 3 games, the Reds aren’t looking too bad for offense so far, on average. Sam LeCure started for the Reds and had a real nice showing in his 2.0 innings of action. He walked a guy, but otherwise didn’t allow a baserunner. Next up was Manny Parra, who had similar results in 2.0 innings of work, only minus the base on balls. Jose Arredondo took over in the fifth and gave up a hit, which was just what Logan Ondrusek did in the sixth. So far so good. Josh Ravin was the unlucky one in the seventh, and he took credit for all 3 of the Indians’ runs before he could log the third out in the inning. Drew Hayes came in to finish off the inning before J.J. Hoover closed her down in the eighth. He gave up 2 walks in the process. 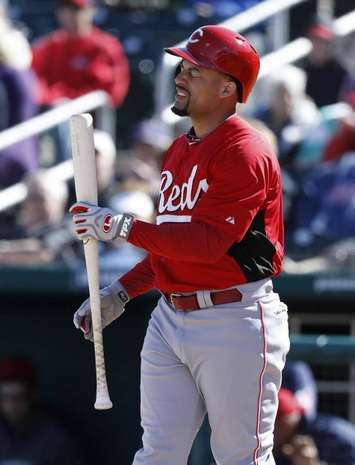 Jason Donald notched the Reds’ only hit yesterday when he singled with one on and one out in the top of the sixth. Neftali Soto walked to load them up, but then Xavier Paul and Ryan LaMarre struck out to end the Reds’ threat. Brandon Phillips, Donald, and Soto each contributed a walk to the team’s OBP, and, never to be outdone in matters of on-baseness, Joey Votto walked twice. 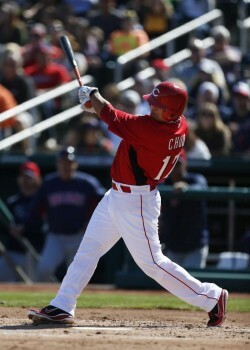 Votto has only 3 official at-bats in the first 3 games of spring training and has gotten on base at a .800 clip. The loss brings the Reds spring training record to 0-3. Today they take on the Brewers. Armando Galarraga faces off against Tyler Thornburg. Posted in Game Wrap, Spring Training. The Spring Training season has started, and Shin-Soo Choo is gaining confidence playing center field for the Cincinnati Reds. Granted, the former right fielder has only played a little bit, and exhibition baseball is nothing like when the games count, but it’s good that Choo has confidence in his ability to make the transition. As expected, Reds manager Dusty Baker has the same confidence in his player. Choo has done well at the plate, too, showing some on-base skills that were completely absent last season from the lead-off spot. If this switch to center field works, this could be a very good season.